The Casablanca Challenge lived up to its name but none of our challenges were as a result of the rally! We started with a newly rebuilt engine which had done about a thousand miles before the first “selectif” over Forestry Commission tracks in Kent. The cars were grouped into four categories – vintageant, classics, modern sub-1400 cc and nine who started in Spain. Crossing the channel we did the third selectif on the Franco-Belgian border on closed public roads. Our time was good and we overtook an MGB on the way – but as everyone completed the route in less than the minimum time we scored that minimum – along with everyone else. There followed a long run to the overnight stop in le Mans and two long driving days first to Burgos in Northern Spain and then to Ronda in the south. It was here that the problem which was to be a recurring feature of the rally manifested itself – points. This set had managed about 2,250 miles – not very good but as I had two spare sets I was not too bothered. Crossing to Tangiers, the rally schedule was disrupted – though it is not clear why. After a ferry crossing which was only delayed by half an hour, the rally arrived at the 12.30 control point some three hours late! 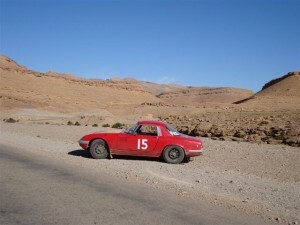 This meant that the first Moroccan test section would be run after dark and driving in Morocco after dark is not for the faint hearted as the roads contain all manner of unlit human, animal and mechanized travelers as well as potholes, ruts and bumps. On the way to the test our brakes failed – well not quite failed – the servo locked on so we stopped and the rally passed us by as we dismantled the servo and applied WD40 to release the brakes. We decided against doing the hill climb with no servo after dark and detoured direct to the hotel – more penalties. Next day we set off for the test sections in “rally order” – those with least penalties going first. Yesterdays problems meant that we were low down the order and in the company of cars slower than us. We would have to overtake them on narrow test sections, relying on their goodwill to pull over and let us past. 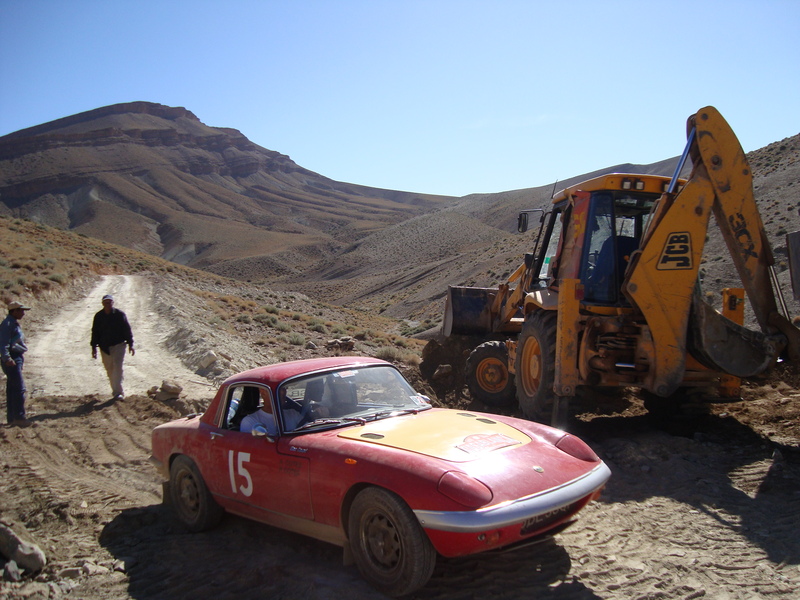 We were not alone with this problem as two other cars had accumulated abnormal penalties during the hill climb – the Sunbeam Tiger who went into a ditch and a Citroen whose electrics had failed. Our times on the five tests were good and we climbed 14 places in the rally order. 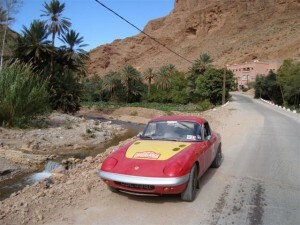 Day 6 of the rally would end in Midelt in the Atlas Mountains. This was the location of our “mishap” when the drive shaft broke on the 2005 Dakar rally. Would Midelt prove to be a disaster for us again? We had sprayed more WD40 at the brake servo and that was working again – on these test sections you needed confidence in your brakes. The tests were on open roads of tarmac or gravel in the hills with sharp, unsighted bends, sometimes amongst the trees and you never knew what to expect next. Leading the way were the “hot hatches” spreading gravel over the bends making the roads more slippery for the cars behind. Our test results for this run were good and we would climb to fifth in class – but much, much worse was yet to come. At the end of the last test we saw a marshal’s car and a rally car facing the wrong way on the road. We assumed the rally car had spun and the marshals were sorting it out. Later we found out that a competitor had gone off the road and crashed 60 metres down the hillside killing the driver. All motorsport is dangerous but to experience it at first hand when it happens to someone you know is distressing. We knew nothing of this as we approached Midelt. The town was a sea of dust as the whole place was being dug up and roads relaid in expectation of a visit by the King in 7 weeks time. Driving up the high Street we saw and were spotted by the garage who repaired us nearly five years ago. Having greeted them all and said our fond farewells we set off to our hotel and the closing time control of the day. Err……….except it wasn’t quite like that! The car wouldn’t start, it had been getting more difficult all day, so as it was pointing uphill, we rolled backwards, bump started the engine – and with a loud bang, broke the differential output shaft!! Could this really be possible? Could we have sheared another shaft five years on in the same place? Sadly, yes, so the car spent the night and the next morning in the garage whilst the shaft was welded up by the same excellent machinist…………… Then we learnt of Warren’s death – not a good day. Day 7 saw us leave the garage well after the rally so we decided to spend the night in the Gorges of Todra where they had their midday stop. At night the Gorges were out in the sticks. The hotel had an outside toilet block and we were asked to go to bed so they could silence the generator which powered the lights and kept the place awake. The consolation was that when you needed that toilet block you looked up the channel formed by the rocks and had a spectacular view of bright shining stars with no possibility of light pollution. 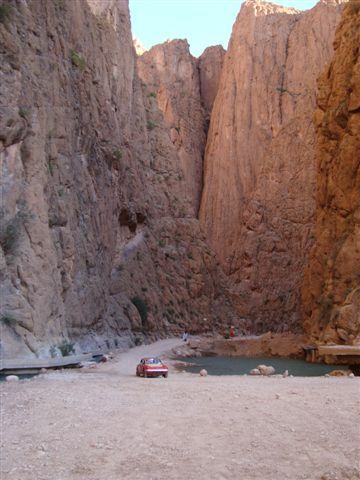 Next day we wanted to see the top of the Gorge, drive over the mountains and down the Dades Gorge – which the guide book said was a good route – and the hotelier said you’d never do it in a car like this. But we knew better……….we’d missed the piece in the guide book where it said you needed a 4WD hovercraft! The road started on good tarmac with the odd washed away section then climbed via a smooth wide gravel track to the top of the ridge. Then it became a rocky track and we were stopped by a crew digging it up to lay storm drains. The car wouldn’t start so they bump started us and the track continued past Berber families living under the overhang of massive rocks. The track got worse, we had to slip the clutch in parts, then the clutch pedal went to the floor boards, the engine stalled and we were 16 kms from the nearest town in a dried up river bed. Silence reigned, no-one was around and things did not look promising. The track ahead did not improve so we decided to retrace our steps. We selected a spot for a seven point turn, took out and cleaned the plugs, turned the key – we had both ignition and clutch! We climbed out of the river bed, past the begging children, past the road crew and returned to the tarmac road to retrace our steps to the main road. Now the engine was spluttering – points again. Stopping at a Shell station, we bought some fuel and more or less got their agreement to use their car wash as shelter from the burning sun. Points changed and timing checked surely the engine would spring into life? No, it needed yet another bump start before, much later than intended, we could head west into the dazzling, low sun towards Marakesh and the rally hotel. Allison’s dreams of seeing two gorges and lunch beside a tinkling stream remained just that. It was dusk as we skirted Ouazzarate and headed north with a mountain range ahead of us – not the Tizi-n-Test which the rally would use but the higher and busier Tizi-n-Tikkla. On one hairpin bend which I took a little wide, the passenger’s door flew open into a lorry. Fortunately only ripping out the door handle with minor damage to the fibreglass; we did not stop. It was 10.15 before we reached our hotel but in the process we discovered that there were 3 Mirage Hotels in Marakesh – and ours inevitably was the third we were directed to! We did our bit for the locals by stalling when asking some traffic police for directions – so they kindly put down their hair dryers to bump start us – again (we’re good at bump starts!). Sunday was the last day of the rally but we were going nowhere – we had to plan our return home and a non-starting car was no help. We checked the battery and decided it was worn out – but the problem was deeper rooted than that and I added a starter motor to my shopping list. An inspection revealed a new problem – the diff oil seal had been damaged and we were leaving a trail of oil behind. We would have to stop every 250 miles to top it up – and home was over 1,500 miles away. Having sorted battery and diff oil, there was still time for some sightseeing before the rally dinner and on Monday we set off for Tangiers and the ferry to Europe. Morocco is a Muslim country but not too strict. Staying in a seaside resort outside Tangiers we asked about wine with the meal. As the restaurant was next door to an Off Licence with a brightly lit Heineken sign we did not expect a problem. We were told we could not drink outside on the pavement but inside was ok. Shortly our “special mint tea” arrived with teapot and tea glasses – but this mint tea was red! A strategically placed plant and nearly empty coke bottle completed the theatre! We spent the next night in Gibraltar before the journey north to the Bilbao ferry. Our first night was in the little town of Zafra, north of Seville. 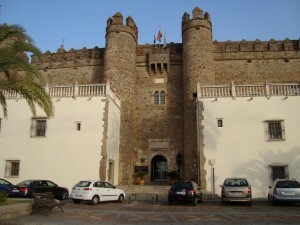 We chose the Parador Hotel – one of a state run chain using buildings of interest. 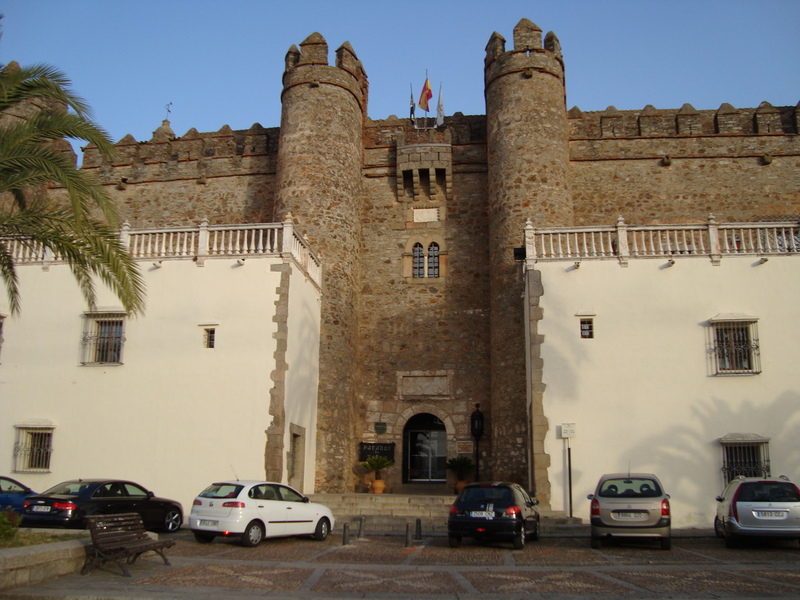 This was an inspired choice – we negotiated a price of 70 euros for a room in a castle dating from 1440 with huge towers and a spectacular open courtyard – magnificent and well worth another visit just for the building and atmosphere – a perfect end to a day of driving. We left early for the 750 km drive to the ferry port. The car was good and we were bowling along near Salamanca when the engine died – no warning, just stopped. The tacho went from 4,000 rpm to zero as we coasted off a convenient slip road, donned our yellow jackets and decided – points. And so it was, the plastic cam had broken off. We put back a set we’d repaired earlier but it would not start. The police stopped at their third drive-by. I showed them we had a spark but not enough battery to start the engine. They returned with what sounded like “pincers” (jump leads) and the thing finally came alive. We set off but with an unhappy car; the rev counter and fuel gauge were erratic and that night we had to change the points yet again (and yes we were stopping to do the diff oil every 250 miles). Next morning the port – oh bliss of security and home via Portsmouth – no-one told us the Bay of Biscay was rough in November…………! You are currently browsing the archives for the Casablanca 2009 category.